The day that changed the cause of my life was in summer 1990! Whilst on a worldwide tour doing odd jobs but mostly selling my handcrafted Jewelry – I returned to the UK for a brief time and during my stay, I went to Covent Garden to visit a shop known as The Bead Shop to replenish my withering stock that I needed for my handmade crafts. After this, I went to the well-known street performers pitch at the piazza in Covent Garden. Here I watched a circus performer who had a huge audience around him and had their full attention and now that included mine. What happened next startled me – he made a silk hanky disappear. I watched him push this hanky into the palm of his hand and slowly and masterfully opened his hand it was gone then he then reached into his mouth and pulled the hanky out of it! The audience gasped and stared! He then proceeded to climb up a Unicycle that was being propped up by two volunteers and they passed up unlit fire clubs to him. He then dismissed his volunteers and he delivered well-rehearsed his hat lines (money lines). After juggling the now lit torches, he dismounted his unicycle and took off his hat and a sea of audience members came forward and put notes and coins into his hat – this seemed to go on for ten minutes or so! I was hooked! I knew then what I wanted to do for the foreseeable future of my life! It is true that Street Performers become so for lots of different reasons – from a love of the arts to the need of extra coin, freedom of expression, alternative lifestyle, worldwide travel, to disciplines oneself in the arts, development of material or some believe that street performing is a good starting point in the world of show business – a stepping stone if you wish! There is no right or wrong way and each of us has our own path to follow. I will always argue that the streets belong to all. I have come across some strongly opinionated buskers who seem to be set in their ways as they lay out what they think a busker should or should not be. Often I can appreciate their argument but I must remind myself and others – you or I am not starting a new wide world religion! No – far from it! The streets belong to all everyone and is a place for every form of expression in creative arts coming together – to me that is a WOW. Regardless of race color or creed, the good, the bad and the damn right awful – we all have the right to express ourselves on the streets. 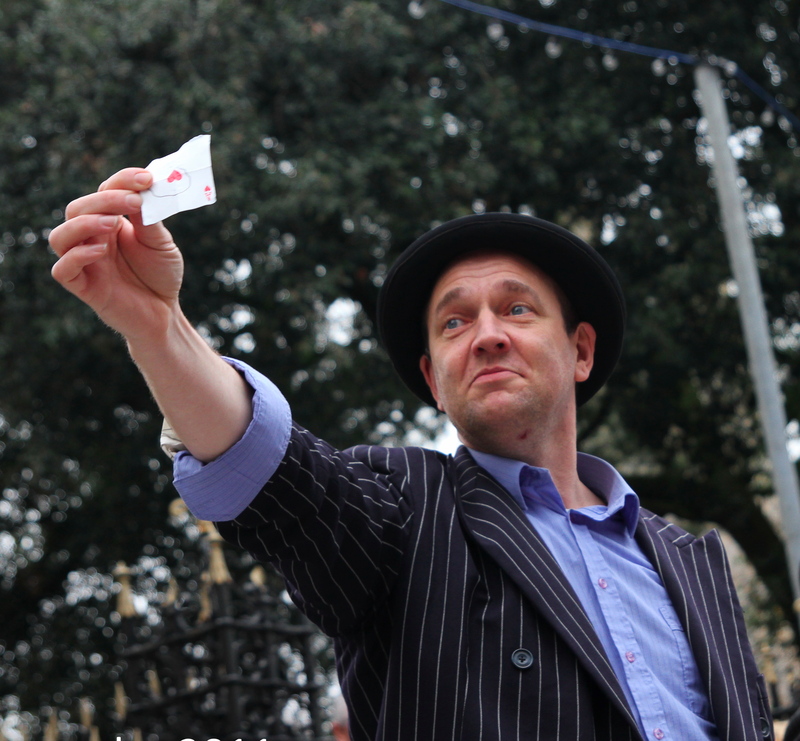 Aspiring street performers and experienced street performers alike – never forget your first steps into the world of street theater and then you will always remain respectful to your fellow artist – in other words – we all had to start somewhere! It is true that the streets are an incredible opportunity to creatively develop your art if you wish to do so. I will always actively encourage performers to grow whilst seeking to grow myself. This is more to to with mental attitude and character than anything else (we will look more into this in future posts). In the meantime, one of the best ways to grow as a performer is by getting out there and performing. In addition have mentors that can give good constructive critic of your show. Spend time practicing and rehearsing but most importantly put into practice what you yourself have rehearsed and performed! It is good practice to set a healthy work environment around you and this is possible to do even if you are on the road living out of a suitcase! Perform – Now go out and do it for real. Perform your show and make it a reality. There are a number of finer points that I will cover in future posts such as – what, where and when. But for now I will finish with some final words of finding a mentor/s. A good mentor is the hard person to find – more so in the magic world as opposed to the circus world. The Magic world is full of dealers that give dealer demonstrations and dispite the fact we can learn a lot from them this does not mean that they will be as a good a mentor. Unlike the world of Circus which is often physically skilled oriented – a skill that has to be handed over and learned. In my experience working direct with a mentor, you can not help but to adopt some of their characteristics. I say this as a word of warning. To help you grow positively and have a good experience with your mentor be sure they actually want to see you grow! For an extreme example – if you want to build a family magic show, creating magical experiences in people’s lives, then there is no point working with someone whose performing style is swearing and cursing and seems to hate or pick on children! they do not speak badly of other performers. Remember the mentor you have – will influence you as a whole.